In an all too familiar pattern, militants proclaiming ties to the so-called “Islamic State” (ISIS) have once again found themselves aiding US foreign policy, this time in the Philippines where the Philippine government has been increasingly seeking closer ties with Beijing at the expense of Washington’s longstanding influence in the Southeast Asian state. Militants have conducted a large scale military operation seizing parts of the southern Philippine city of Marawi where they have carried out a variety of atrocities and hoisted ISIS flags. Located on the southern island of Mindanao, the city is only slightly removed from Al Qaeda affiliate Abu Sayaff’s primary area of operation on nearby Jolo and Basilan islands. Abu Sayaff and other regional affiliates have received much of their funding and support from one of America’s oldest and closest Mideast allies, Saudi Arabia with whom the US has just recently sealed another unprecedented arms deal. It is now reported that the US military is aiding Philippine troops in attempts to retake the city, highlighting just how ISIS has been used as a pretext to justify Washington’s continued influence in the nation – and particularly – the presence of US military forces in Southeast Asia. 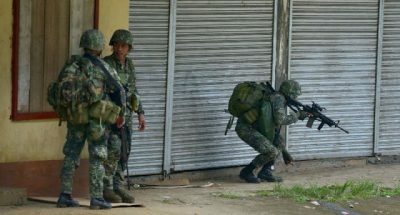 US troops are on the ground helping local soldiers battle Islamist militants in a Philippine city, a Filipino military spokesman said Wednesday, giving the most detailed account of their role. The small number of US soldiers are providing vital surveillance assistance and, although they do not have a combat role, are allowed to open fire on the militants if attacked first, spokesman Brigadier-General Restituto Padilla said. The issue of US troops in the Philippines has become extremely sensitive since Rodrigo Duterte became president last year and sought to downgrade his nation’s military alliance with the United States in favour of China. However, the fact that the militants are funded and supported by US ally Saudi Arabia, and that the Islamic State itself was admittedly a creation of US and Persian Gulf interests, their sudden and spectacular appearance in the Philippines just as US-Philippine ties were at their lowest and impetus to finally remove America’s presence from the nation at its highest, indicate that the recent mayhem is more than convenient coincidence. Dwindling geopolitical leverage in Asia Pacific has caused the United States to seek a variety of conflicts to serve as pretexts for its continued presence in the region. This includes tensions in the South China Sea where the US has sought to line up nations against China to challenge Beijing’s claims over territory and islands there. One of those nations – in fact – included the Philippines which sidelined an elaborate US-led legal charade over China’s claims in the South China Sea in favor of bilateral talks with Beijing directly – excluding the US. The US has also actively provoked conflict on the Korean Peninsula, threatening North Korea’s government with a potential first strike aimed at “decapitating” its civilian and military leadership. Such meddling and the predictable tensions that result have ensured America’s continued military presence in South Korea as well as years of lucrative defense contracts. And while Washington’s use of ISIS in the Philippines is the most recent example of how terrorism is being used to justify America’s military presence in the region, it certainly isn’t the first. Militancy in Thailand’s south has been repeatedly used as a pretext for Washington to seek closer ties to Bangkok – ties Bangkok has repeatedly rejected in favor of more diverse military cooperation and acquisitions from China, Russia, Europe, and its own growing domestic industry. Beyond Asia, the US has used terrorism – including use of ISIS specifically – to justify its military presence everywhere from Libya to Syria and Iraq to Afghanistan. 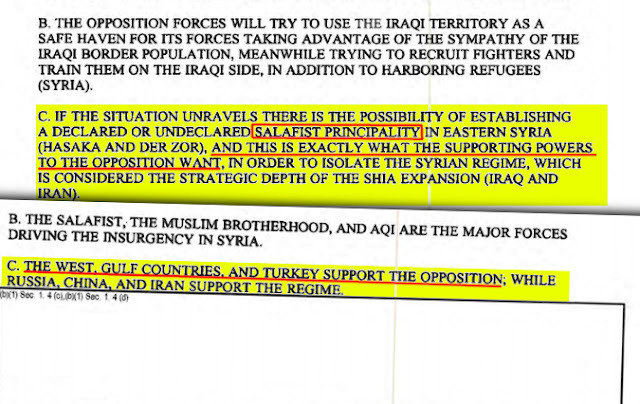 It was in a leaked 2012 US Defense Intelligence Agency (DIA) memo that it was revealed the US and its allies sought the creation of a “Salafist principality” in eastern Syria for the specific purpose of “isolating” the Syrian government. Despite Washington’s claims of fighting ISIS in Syria, it wasn’t until Russia’s military intervention in 2015 that saw the terrorist organization’s supply lines from Turkey ravaged and its territory and fighting capacity rolled back. Prolonging ISIS’ existence is the continued support it receives from America’s closest allies in the region, including Saudi Arabia, Turkey, Qatar, Jordan, and Israel. The US itself has on multiple occasions now directly attacked Syrian forces engaged in combat against ISIS. Most recently, the US has deployed long-range artillery in southern Syria specifically to target Syrian forces that have overwhelmed ISIS on the Syrian-Iraqi border and threaten to jeopardize Saudi-Jordanian supply lines that have fed the terror organization’s presence in Syria for years. Considering this, ISIS’ “sudden” appearance in the Philippines, just in time to justify Washington’s otherwise unjustified and unwanted presence and influence in the nation is more than mere coincidence – it is another example of the United States creating crises in order to provide “solutions” that predictably include its continued existence as a regional hegemon. Not unlike a crooked window repair service that breaks windows at night and repairs them for a price by day, the US is sowing tensions, conflict, murder, and mayhem, then posing as the solution – for a steep geopolitical price. For nations like the Philippines, turning to its regional neighbors, China, and Russia who have more honest interests in defeating US-sponsored terrorism also targeting them respectively, is the only way to genuinely address immediate security issues and ensure longer-term peace and prosperity. America’s presence in the Philippines and its role in extinguishing geopolitical fires it itself lit only guarantees the Philippines a protracted and costly existence as a proxy and pawn amid America’s Asia Pacific ambitions.